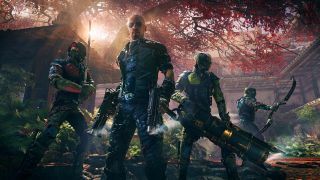 Shadow Warrior was a great source of gratuitous comedic violence and phallic wordplay, and its sequel looks set to continue that tradition. Tyler saw Shadow Warrior 2 at PAX East last week and came away very impressed, and based on the 12 minutes of new footage embedded above, it's easy to see why. Movement is faster and more fluid, and the enemies are grotesque and plentiful. If it's gameplay footage you're after, there's a tonne of it for Shadow Warrior 2: here's a good 15 minute chunk from E3 2015, and Tyler's hands-on is peppered with it too. Shadow Warrior 2 is expected to release some time in 2016.